In theaters early next month, TERMINATOR: GENISYS is the state-of-the-art fifth installment in the popular sci-fi franchise introduced by JAMES CAMERON over three decades ago. The first in what is slated to be a new trilogy, TERMINATOR: GENISYS marks an amazing return to the series by ARNOLD SCHWARZENEGGER who, through the miracles of modern movie making, finds himself in mortal combat with a much younger version of himself. At the ripe young age of 67, SCHWARZENEGGER seems none the worse for wear and proves to be a formidable foe against his younger self. 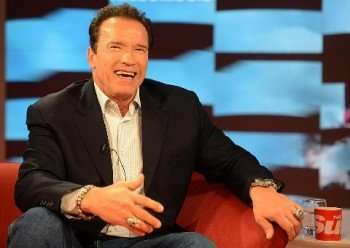 SCHWARZENEGGER took a sabbatical from acting when elected to the office of California Governor in 2003 and served in that capacity until 2011. And, while stepping seamlessly back into the world of show biz, the former ‘Governator’ has continued to keep his eye on world affairs. At yesterday’s press conference to promote the release of the upcoming TERMINATOR: GENISYS, SCHWARZENEGGER responded candidly to a question regarding the landmark SCOTUS decision on marriage equality. TERMINATOR: GENISYS opens in theaters 7/1. Today is a historic day in American sports history. Jason Collins, who plays for the NBA’s Washington Wizards, sat down in an interview with Sports Illustrated and announced that he is gay, making him the first active player in a major American team sport to announce that he is gay. Collins said, “I didn’t set out to be the first openly gay athlete playing in a major American team sport. But since I am, I’m happy to start the conversation.” Collins had a lot of support from his fellow NBA Players. NBA great Kobe Bryant tweeted “Proud of @jasoncollins34,” the tweet read, “Don’t suffocate who u r because of the ignorance of others #courage #support #mambaarmystandup #BYOU”. Last week, we spoke to former All Pro and Super Bowl MVP Kurt Warner, who is the host of the USA Network show The Moment. He told us that he has no problem with having gay teammates, and that people should never step in the way of sexual orientation. (Click on the media bar below to hear Kurt Warner). Do you agree with the former NFL great? We applaud Jason Collins and hope that he will be a role model for others who have dealt with hiding who they are. The ABC hit medical drama Grey’s Anatomy has never been shy about taking on controversial story lines. One of the biggest story lines for the past few seasons is the lesbian relationship between Dr. Callie Torres (Sara Ramirez) and Dr. Arizona Robbins (Jessica Capshaw). While many adore and admire the relationship and struggles that both characters face, there have been some who are outraged by it. Whether audiences like the relationship or not, Jessica Capshaw says she feels lucky to have the support of the fans, and that the writing of the show is what makes it even more special. Grey’s Anatomy airs Thursday night’s 8/7 central on ABC. Raising a family and leading a productive, creative life must be hard for many people (I wouldn’t know), but for Tina Fey, it’s all about finding your muse in a laundry room. In a recent interview, she talked about how she found the time to pen her book Bossypants. ‘Glee’-Quality For All: Has FOX’s Hit Helped Change Laws? Over the course of the four seasons that the FOX hit series Glee has been on the air, it has consistently highlighted and never shied away from many important social issues, including bullying and gay issues. In fact, the show has been commended for tackling these issues. During the last election, some states around the country passed marriage equality laws. We spoke to Glee stars Cory Monteith and Chris Colfer and asked them if they feel that Glee has influenced changing people’s thoughts. A new episode of Glee airs Thursday night 9/8 after American Idol on FOX. Although Vertigo is considered today as one of Alfred Hitchcock’s masterworks (Sight and Sound magazine named it the greatest film of all time), it actually was a critical and commercial flop in 1958. 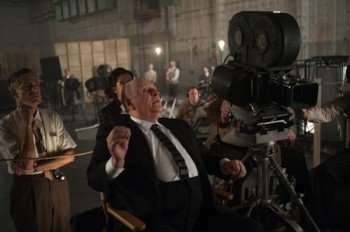 Although Mr. Hitchcock found favor once again with the 1959 release of his action packed crowd pleaser North by Northwest, he was still slightly wounded from his Vertigo experience, and filmmaker Sacha Gervasi briefly shows a bit of that insecurity in the new movie Hitchcock. Sir Anthony Hopkins stars as the master of suspense, as he plays an artist determined on finding new creative horizons. It’s the director’s creative gambit in shooting Psycho, as well as his relationship with his wife Alma (Helen Mirren), which serves as the narrative spine of Hitchcock. Hitchcock opens in limited release Friday, November 23rd.